Every year the Collin County Aggie Moms raise funds to provide scholarships to deserving Collin County Students on their way to Texas A&M University in College Station, Galveston, or the Health Science Center. We greatly appreciate your support of this effort. 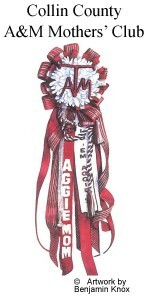 The Collin County Aggie Moms’ Club is pleased to offer scholarship opportunities to students who will be enrolled as full-time students at Texas A&M University during the upcoming school year. The actual number of scholarships awarded is based on the amount of funds raised throughout the Aggie Moms’ Club program year, and thus varies from year to year. Applications are available in the spring. Scholarship recipients are announced in May. Scholarships will be awarded to freshman, transfer students and returning A&M students. The scholarship selection committee chooses the scholarship recipients. Each scholarship is paid directly to Texas A&M University, deducted from the fee statement at one-half of the scholarship amount per semester. The student must reside in Collin County OR have graduated from a Collin County high school OR be an immediate family member or be affiliated with a Collin County Aggie Moms’ Club member to be eligible. Any Collin County high school senior or Collin County college transfer accepted as a full time student (12 hours* or full time status according to TAMU guidelines) to Texas A&M University – College Station, Galveston or Qatar for the upcoming fall semester 2019 may apply. Any student currently enrolled at Texas A&M University – College Station, Galveston or Qatar may apply for a scholarship to be disbursed in the upcoming fall & spring semester. If you have already received a CCAM scholarship, Congratulations! However, you may not reapply. Fill in the application completely. Please type or use black or blue ink. If additional space is needed feel free to attach another sheet to the application. Please write as clearly as possible so each answer may be considered. Incomplete packets cannot be considered. If you overnight your package, please write “no signature required” on envelope. *ALL SCHOLARSHIP APPLICATIONS ARE REVIEWED ANONYMOUSLY BY THE SCHOLARSHIP COMMITTEE. The personal information page does not go to the selection committee.